On successful attack using 15 Attack Turns: Restored degree of randomness to Naquadah gained; mutual 'war' relation yields returns of 100 percent of available Naquadah; single 'war' relation setting yields returns between 90 and 100 percent of available Naquadah; 'neutral' relation setting yields returns between 75 and 95 percent of available Naquadah. Army size limits to maximum Naquadah stolen per attack apply. Style 2017: Fixed erroneous log-out, occurring daily between 00:00 and 01:00 GameTime. 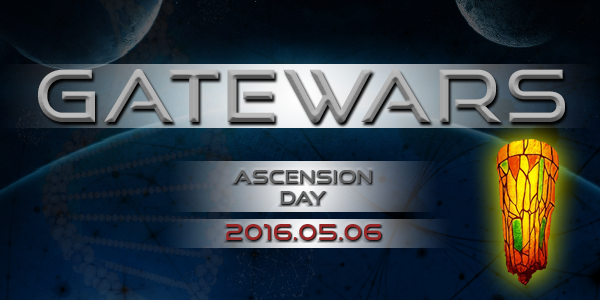 Password Reset: Enabled individual password reset feature for GateWars: Ascended. Players are recommended to ensure their password and e-mail combination for Ascended matches their associated account on Main. This feature enables players to arrange this themselves. Accounts can be manually deleted by their owner after 7 days of inactivity - no attacking, spying, sabotaging, public trading, private brokering, protection or in Bloodwar. On attack: occurrence of checkbox for Blood War now subject to Alliance Attitude. Managed by leadership. For now, attitude has no effects other than manipulating how far an alliance's Bloodmeter has to get before triggering the checkbox. Market PPT restricted if more than 47 hours of PPT left. Full Planet overview available, "View All Planets" in Planet navigation menu. New Server Location Major update - "Great Migration"
Our second major update in a very short timespan! The GateWars family, games and forum, is moving to a new server. GateWa.rs is a portal from where all the games can easily be reached. GateWars: Main can be found at Main.GateWa.rs. The Forum will transition on Monday, July 25th, 2017. For this migration the Forum will have 3 hours of downtime. Main, Ascended and NewGrounds will move - as one - either on Monday, July 25th, 2017 or Friday, July 28th. GateWars: Origins migrated a week ago. Chaos and Quantum will follow at an unspecified date. The administration has considered moving to a new location with more control over, and better, hardware for a while. Furthermore, the new domain and IP are 'fresh', which should resolve the leftover issues with some e-mails not passing spam filters. All your old links to the game will still work, but you will be redirected to the new address. E-mails from the game and administration will be sent from familiar, yet new addresses. Admin Jason and Support have been working to make sure this migration will be as smooth as possible. Minor downtime (announced briefly in advance) is to be expected as the transition is performed. This migration has been pre-planned and thoroughly tested. To a large extent, the migration is already complete. One of our games, GateWars: Origins, was moved several days ago, with the type of redirect in place that will also be applied to other transitioning elements. Regarding the '.rs' top level domain: the TLD is Serbian ('Republic of Serbia'). This makes our domain name shorter and more modern! New Graphics / Layout Major release - "Style 2017"
A new, mobile-friendly (try it! ), more-ready-for-the-future layout to use with GateWars. Take some time to get used to it, everything that was there, is there. In most cases, easier to reach too. This new layout has been thoroughly tested during a 9 month development process. Should you inadvertently happen across something we missed either to notice or to fix, please e-mail support@gatewa.rs with the page name and some information on how you got to where you ran into the issue. "This is another step for the future of GateWars... a nice balance between nostalgia and ease of use." Alliance PPT oddity: Fixed an inconspicuous anomaly with the cumulative nature of alliance PPTs. Alliance PPTs now stack properly. In the same fix, regulated vacation mode entry effect to enforce 24 hours off PPT prior to vacationing. All PPT is treated in the same way: alliance, ascension, market and bonus. Introducing Player-to-Player market: anonymous market where players can post sell orders and buy select amounts from those orders. A trade history is available where you can see how much your sell orders have earned you. The Public Market is region-locked, you can trade with your fellow inhabitants of either Pergatory or Normal, but not with both at the same time, or when travelling. Average trade ratios are presented to give an idea of what a fair trade would be. This is to assist people new to the system. Other than that, Free Capitalism For Everyone. Go get rich. As a non-Supporter your daily number of Market operations is limited to one. Buyer: When buying Attack Turns, you are limited to the cap. Seller: When receiving Attack Turns, you receive Personal Attack Turns. When receiving Untrained Soldiers, you receive Miners. When receiving Naquadah, you receive this in your Bank. Introducing 'Alliance Tax': Set a tax rate on banking operations for your alliance members. 50% of the tax is collected into the alliance bank, 50% is lost to corrupt banking officials. This should add some means for people to re-fill their alliance banks, making the Blood War an interesting option (if your enemy has a big bank, steal the big bucks! ), as well as give starting alliances a chance to make a running start. Tax rate is default 0%, so your alliance leader will have to actively set the rate. Good luck! To prevent abuse login is restricted to one session at a time. Reworked/streamlined registration process. Newly registering players can now choose between 4 basic race configurations (which they can change to suit their wishes in-game), hopefully easing the registration for those unfamiliar with GateWars. In addition changes were made to the activation process. The Administration was informed that e-mails regularly were either not sent, or not received. In so far as the issue lies with us (sending) the changes implemented should prevent this from happening to you. You are still encouraged to check your Spam folder should you not receive your e-mail, contact GateWars Support with -at least- your username. Security update in regards to 'multiple accounts per user' rules. House elections: Voting for a House Leader can be done after 6 days of changing the vote. While the House bureaucracy is processing your vote, you are protected from being kicked from the house for a single day. House elections: Changing House no longer affects time to next vote. Upon entering a new house, you automatically vote for yourself. House elections: You can now vote once every 3 days. This tweak was required to allow the taking of a house by a new alliance before being kicked by the current house leader. Planet Conquest Limits: Triple, Dual 'possession limit' corrected after conquering any Triple or Dual planets degrading on conquest. Planet Degradation: Triples/Duals degrade to Duals/Singles. Triple->Dual degradation after 2 conquests, Dual->Single degradation after 5. Blood War: can un-train miners in pre-war stage. Blood War: Individual Military Experience now properly documents kills on both attack AND defence troops. Blood War: Alliance Military Experience - general rewrite. Lifer Suicide: Further changes/balancing topic of discussion until March 11th. Go here to discuss your views on lifer kill rates, and make your voice heard. Private Broker: Trade Maximums updated in response to broker abuse. Read more detailed explanations here (on the Forums) ! * Updates archived (click the bar below to check them out). Brought to you by Kingdom Games Ltd.
note: no images are from copyrighted sources; we are not affiliated with any TV or movie company; if it doesn't say 'Kingdom Games' on the site, it is not ours.